According to the Wall Street Journal, “Auctioneering is one of the top ten highest paying professions in the United States.” Being an auctioneer is exciting and rewarding. No sales technique compares to a well- run auction marked by the rhythm of a great auction “chant”. Chanting, the method of speaking auctioneers use, requires clarity, speed, and rhythm. Income is directly related to the quantity and quality of the items sold. Some auctions, both for profit and charity, include antiques, art, machinery, or entire estates. Use your imagination to reach a tidy sum of cash! You will learn: Breathing and voice techniques, Speed and precision, Ethics, Public Speaking, Advertising, Computer Applications, State Laws. 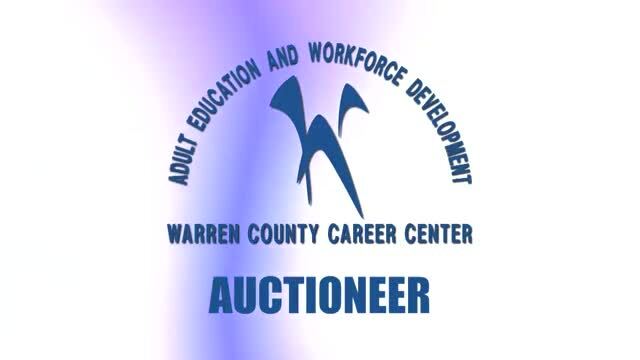 The Warren County Career Center’s Auctioneer Program is approved by the Ohio Department of Agriculture. Reciprocity states include: AL, FL, GA, IL, IN, KY, LA, MS, NC, PA, SC, TN, TX, VA, AND WV. Contact the Coordinator, Ken McHone, at 513.933.3957, or email Ken.McHone@mywccc.org.